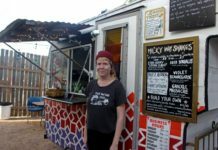 Diners in downtown Denison have a new set of options when choosing where to eat following the opening of a new food truck park Friday. 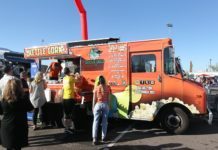 The park, located across from Albertsons on Crawford, will feature four permanent food trucks with two spaces for additional trucks, seating and a stage for entertainment and musical performances. 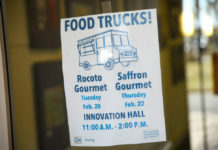 By about 11:30 a.m., more than 60 people had come to try the fare of the four trucks that were available for the grand opening. Earlier that morning, workers were still setting up the final touches on the small paved lot that will be the home for the food truck park. Workers finished hammering final nails into the stage and the first of the food trucks were lining up to take their spots on the exterior line of the lot. 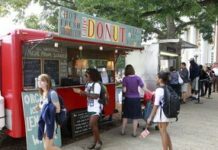 Kevin Hempkins, representing property owner Hempkins partners, said the food truck park project first saw life in July of 2017 when it was approved by the Historic Preservation Board. Representatives for the project previously said that there were some delays related to restroom requirements on site. 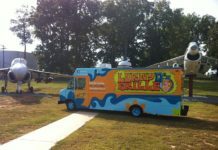 The decision to convert the empty lot into a food truck park came following the demolition of the adjacent Bank of America motor bank by the city of Denison early last year. This was a part of the agreement between Hempkins Partners and the city for the purchase of the former Main Street bank building, which will serve as the future home of Denison City Hall. 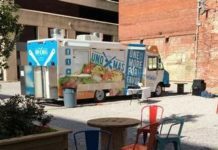 Hempkins said developers chose to use the now vacant lot as a food truck park to add onto other incoming restaurant developments that are coming to downtown, including a new Subway sandwich shop just over one block away. 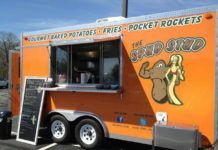 Hempkins said current plans call for the four food trucks to be able to open at the spot each day. 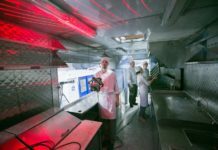 It will be up to each truck to set its own schedule with regard to weekends and other days, he said. As this is an outdoor location, Hempkins said weather will also play a factor in schedules. “We plan to be here for a party today, but may be cancelling tomorrow,” he said with a laugh, referring to cold and wet weather expected to roll into the region. 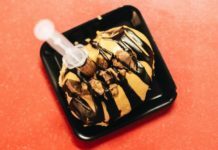 For the owners of B Dawgz Street Dawgz, Friday’s opening represents the fruits of efforts to break into the Denison market. 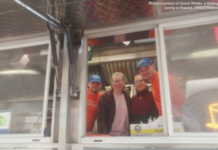 While the hot dog vendor has seen success in Sherman, differences in the permitting policies, which require a fixed address, proved to be a hurdle before now. “We’ve been waiting up until now for that perfect spot for our permitting,” Brad Wells of B Dawgz said. 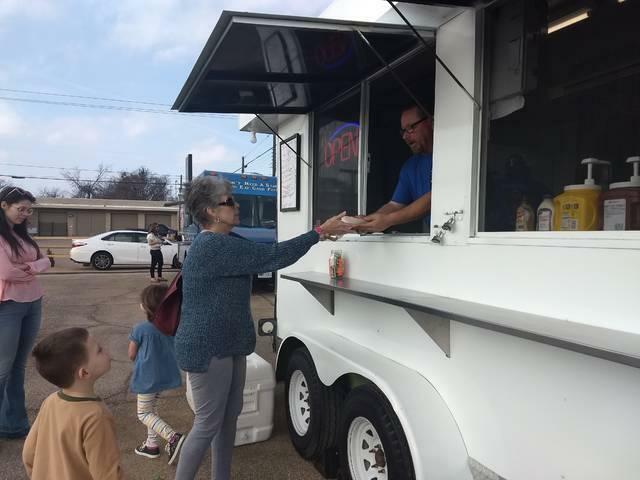 For Friday’s grand opening, Wells said the truck was serving everything from tacos and hot dogs to “The Beast” — a grilled cheese sandwich with a hot dog, chili, grilled cheese brisket and bacon on top that served as their signature item. 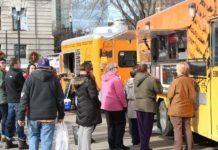 Wells said he has been watching the food truck industry evolve and come to prominence for many years and has seen businesses grow in the Dallas area over the past decade. 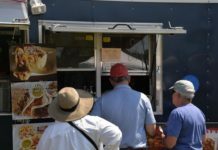 Among the first visitors to the park Friday morning was Joe Madden, who placed the first order of the day, and the park’s life, at the hibachi truck. “I am just excited about what it can bring to downtown,” he said. 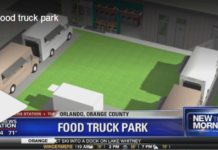 Madden said the biggest appeal of the park is that it can bring a wider variety of food and dining options together in a small area. Beyond that, he said it added new foods that otherwise are not seen very often in the Sherman-Denison Market. “Sherman-Denison is full of chains but we have few mom and pop operations like this,” he said. This variety will be an asset, Madden said, as the city holds festivals and during football games and other attractions in downtown.